If your store isn’t recently trained on spotting minors’ attempts to purchase any FDA (or state) regulated age-restricted product, then now is the time to make sure all your responsible retailing efforts are in order. Requiring employees to verify age by way of photographic identification or electronic scanning device. The We Card Program has some suggestions and resources to help you meet and exceed each of these four steps. 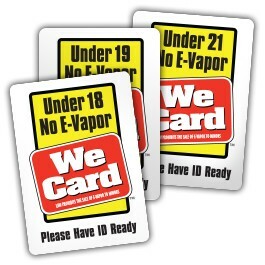 We Card has a Company Tobacco Sales Policy & Employee Acknowledgement of Company Policy template that you can customize, put on your company letterhead and distribute to every employee. Consider using this as your starting point, add any additional tobacco sales policies you may already have, and get each employee to read and sign it and keep a copy in your employee files. It’s a free download at www.wecard.org in our Resource Center. Employees need to know and understand both the federal law and FDA regulations and state laws as well. The same goes for any local laws that may differ from the federal or state requirement. Here too, We Card has a resource for you – as free download at our Resource Center -- www.wecard.org. Go to We Card’s State Law Summaries where you’ll find the minimum-age requirement, the restricted products, the acceptable forms of ID, and if there is a government state sign requirement (and how to get one). For FDA requirements, be sure to see our summary – We Card’s Federal Law and FDA Regulations Summary. 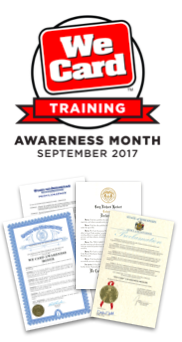 Download these resources, and use them to inform your employees. We also have an Employee Guide that you can purchase separately or as part of a We Card Renewal Kit or an e-Vapor Kit. These Guides provide a summary of state law, FDA regulations and tips on “carding.” State laws and FDA requirements are also incorporated fully into We Card’s online training. You determine how employees are disciplined if they fail a compliance check. We Card can provide support by encouraging you to consider re-training employees who do not perform properly and offering refresher training on a regular basis for veteran employees. To provide balance, we also recommend that you reward employees who do perform properly – consider regular praise, recognition and other incentives to encourage compliance. We Card has tools to assist your sales associates with this age verification step as customers are asked for photographic identification. 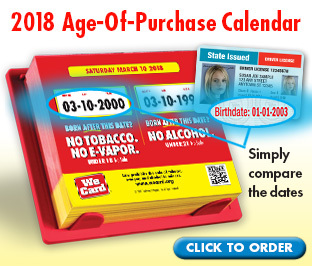 Our We Card Age of Purchase Calendar makes this step easier with the page-a-day calendar. You may also have a scanner or register age-prompt system for age-restricted products. One new option is We Card’s Age Checker App. This iPhone app scans driver license bar codes, calculates customer’s ages and provides “OK TO SELL” or “DO NOT SELL” messages for tobacco, vaping products and alcohol using your store’s state or local law minimum-age requirements of 18, 19 or 21 years old. Android version coming soon. Be sure to train employees to use it each-and-every time. And be aware that if FDA issues a citation to your store, you may receive two violations: one for selling to a minor and another for not asking for ID. Following these four steps will better position your store for compliance. Make sure to equip your store with in-store signage, including state-required signs. These are helpful to alert your customers and employees that carding and denying illegal sales to minors is your policy.